Great job to everyone involved. Now I'm off to paint some Petty cars!!! pshafer3327 and InsideLine like this. Can't describe how much I am blown away by your work on this. The car models are great, high framerate, the detail work on helmets, pit crews, even the decal on the dash is all noticed and appreciated. Fantastic!!! May even bring me out of a paint slump for nearly 6+ months now. I'll check the sites and see what has been done but I know I have artwork for Schrader's regular #33, etc. Thanks again! USSTalladega, InsideLine and gojimmie like this. It has gotten me to dust off the PSP for sure... I haven't seen anything really out there for download yet, so if you do find some things, please share where they are. Thanks! InsideLine and 11rows0f3 like this. Don't get too excited, I am headed out the door now and my weekend is packed, but "it is started" lol Ken Schrader's 1998 Regular scheme. I'll get is done as quick as I can, maybe two weeks, before I can post but I'll crank late at night when I have some time. Thanks again for this great mod. InsideLine, ThatOneShredder and roostmotor87 like this. Bad news, it's 1:30 AM... Good news, I made a crap ton of progress tonight on my first car for this Mod. I'll add some more associate sponsors, helmet and uniform and post in the next few days! Update, holy crud, my OCD is killing me. I didn't realize that almost every race Schrader had different associate sponsors in 1998. Discount Food Mart, Circle K, Ingles, THREE different Oakwood Homes (that I've seen), two different Bari Foods and Bari Foods Distributors... plus the No Bull 5, early season "In Loving Memory of T. Wayne". I might throw in a couple versions, but I am not doing 35 different cars. Mydnyte, canadienhits, USSTalladega and 12 others like this. Will you be releasing these cars? Big thanks to y'all for the basic templates. Been doing some work on this bit of nostalgia for this great mod. CAkin24, GurtonBuster, 18fan4life and 9 others like this. Man that Nascar 96 brings back memories and looks perfect. 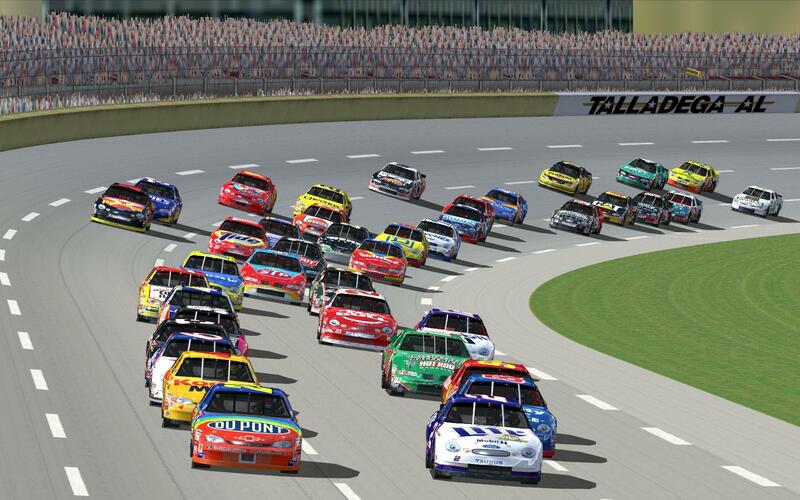 Nascar Racing 2 I spent so many hours racing full races as a kid. It also began my painting interest with the in-game paintshop. Still have my original disc and the book that came with it too. gojimmie and Jr_Fan like this. Loving the CRAP out of this mod! 11rows0f3 and Mystical like this. THANK YOU!! THANK YOU SO MUCH! Nice job on 33 Kenny car!! Used last night. Thanks for all your hard work!! So...I just noticed that Robbert Pressley's #77 is a Thunderbird. I guess they didn't run the Taurus in Daytona? Indeed they didn't. Neither did Chad Little. Even Jimmy Spencer ran a Thunderbird in the Bud Shootout and it pissed Nascar off. He wound up running the Taurus in the 500. Well, I remember some teams saying the Thunderbird was better Aero/Power wise I think. nj9703 and ThatOneShredder like this. Thank You & Team for all your hard work. I look forward to painting some retro rides. Always fun to try and find the correct, older logos of companies. Might there be plans for a GNS version with Busch carset? Someone at NNRacing is making a BGN carset, I am not sure about plans with the physics though.